My father worked in agriculture so our family moved around rural Ontario a lot before settling in Mississauga, where I spent most of my childhood. I’ve always loved my home province – safe, friendly and bursting with natural beauty. Despite moving frequently and experiencing many small towns across Ontario, there’s so much more to explore, which I learned last week when my husband, son and I took an overnight trip to York Durham Headwaters, a region just an hour’s drive from Mississauga and stayed at the lovely Hockley Valley Resort. York Durham Headwaters calls itself Ontario’s ultimate road trip destination and I can see why. The drive from Mississauga was beyond picturesque with long, winding roads and a kaleidoscope of colours, as the fall leaves were just starting to turn from green to fiery reds, burnt oranges and golden yellows. Our trip to York Durham Headwaters was to check out the Temperance and Temptation tour, a journey designed to take visitors back in time to Ontario’s ‘Prohibition Era’ when the Ontario Temperance Act was passed in 1916, prohibiting alcohol in the province. But before starting on our self-guided tour of the region, we checked into Hockley Valley Resort in Mono, Ontario, for wining, dining and some luxurious spa time! 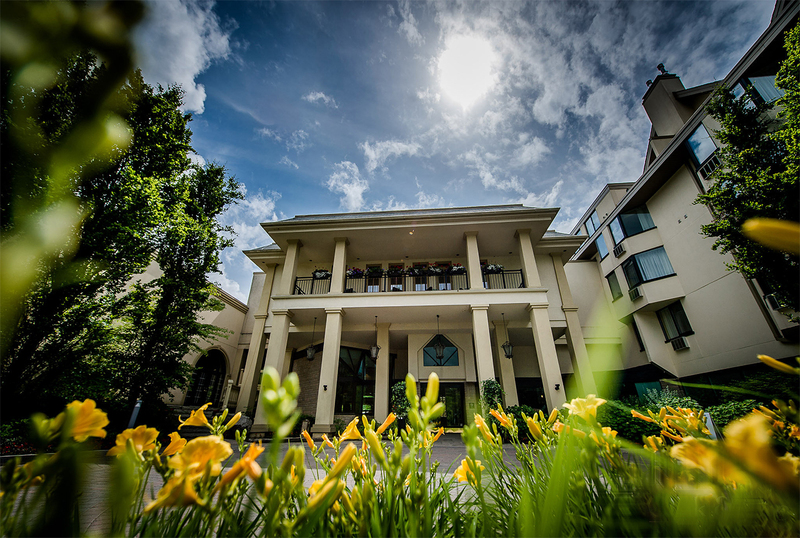 Hockley Valley Resort is nestled within the gorgeous landscape of Mono, Ontario. It’s the perfect escape from the city and an ideal place for a weekend getaway. Upon arrival, we checked into our premier resort room, which was lovely and modern (I loved the hardwood floors) and had panoramic views of the golf course and valley down below. After settling in to our room, we headed a kilometer up the road to Adamo Estate Winery for a tour and tasting. The winery has an interesting history, which you can read about here but today, this sprawling vineyard is home to about 23,000 vines over 25 acres, in addition to a 20,000 square foot facility for wine production, tastings and retail. We kicked our afternoon off by tasting about 10 different wines and while I am admittedly no oenophile, they were all delicious in their own distinct way and I loved learning about the varieties of grapes and the wines that they yield. Our tasting was accompanied by some tasty nibbles, including fried and salted pasta dough. Um, what? Where has this been all my life? And yes, I’ll have some more, please. The spa was conveniently located on the third floor of the resort, the same floor as our room. In the true spirit of rest and relaxation, I appreciated that I didn’t have to go far! I blissed out with a full-body massage and an oxygen facial whereby pure oxygen is infused into the skin and lots of expensive and fab-smelling serums and gels are massaged into your face to make you feel like you have movie star skin by the time you leave. The spa menu is extensive and offers pretty much any service you could hope for. We dined at Cabin that evening, the resort’s main restaurant and had a wonderful experience (even with a toddler in tow who spilled his milk everywhere!) The dining space is gorgeous – a charming blend of modern design and rustic comfort. Think: reclaimed hardwood floors, wooden beams and a steel and glass chandelier. But décor aside, the food was incredible and if you go, I recommend the beet caprese salad made with Ontario buffalo mozzarella, organic arugula, aqua greens, basil pesto, toasted pine nuts and Adamo Estate olive oil. I’m salivating just thinking about it, which is saying something because I mean, come on … it’s a beet salad, not exactly something you’d expect to crave. But not only were the flavours perfectly paired but you could taste the freshness of the ingredients, which is a big part of the resort’s approach to food. Everything they serve highlights their dedication to providing guests with a farm-to-table culinary experience and at Cabin, the menu features the best of what’s local, using ingredients from their own two-acre fruit and vegetable garden, seasonal preserves and other fare from local farmers. It’s worth the drive to Hockley Valley Resort just for dinner!